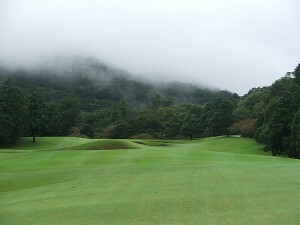 Hirono Golf Club is located 15 miles from Kobe on the main island of Honshu. It is one of the most exclusively private clubs in the world. It is the work of Charles Alison, an Englishman who is responsible for many of Japan’s great golf courses. The influence of some of the best British great courses can be seen on this course. The course is beautiful as well as challenging. Alison combined subtle used of bunkering and different variation of water hazards to make this course a great test of Japan’s golf. Almost every hole is lined with trees that requires a straight shot off the tee. The course has a total yardage of 6980 with a Par 72. The 12th hole is considered one of the best par 5 hole in Japan. It is 550 yards long and the tee box is situated on an inlet of a lake. Players will need to carry the lake as well as a rough to get safely on the fairway. It is an intimidating shot for amateurs and a challenging one for professionals. On the fairway, there is still another 2 shots to get to the green unless you are a long hitter.